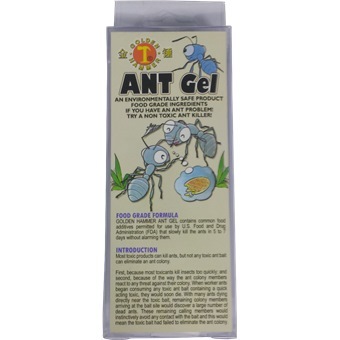 ANT GEL - 30GM is rated 5.0 out of 5 by 1. Golden Hammer Ant Gel employs food additives as slow acting bait toxicants. Worker Ants consuming the bait containing the right proportion of slow acting toxicants would not die immediately, but would instead die sometime after they return to the nest. When they leave the bait to return to the nest, these worker ants would instinctively take some of the bait back to feed the other colony members. By the time the ant colony senses something is wrong, it will be days after and too late to react, as the slow toxicants would have spread to all the other ant members, eliminating them. Rated 5 out of 5 by Francis Abi from Great Buy The ant gel is very much effective for getting rid of ants.